An extremely unsual variant upon Pinkerton's seminal map of North America. 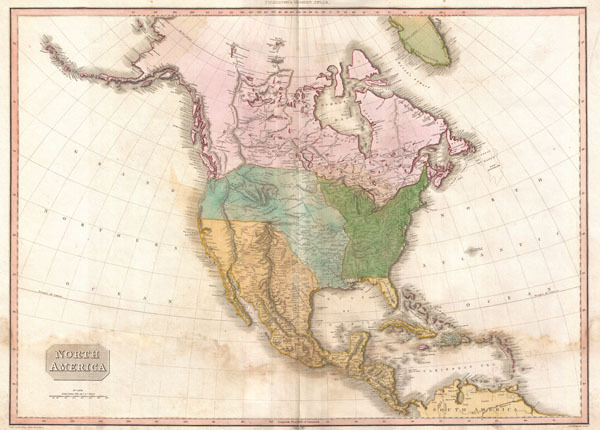 This is an extremely unusual mapping of North America prepared for the 1818 American edition of Pinkerton's Atlas. Although the basic engraving remains identical to Pinkerton's Atlas of 1813, published in London, the coloration has been updated to reflect American sensibilities. Where the British edition leaves the borders in the northwest somewhat vague, this edition draws a specific line roughly along the 50th parallel that descends at an angle west of the Rockies to meet the sea around Mt. Rainier. Further, while the London edition attributes Spanish dominion to all lands west of the Mississippi, this edition identifies Louisiana west of the Red River and south of the 40th parallel. Cartographically Pinkerton's map presents a curious amalgam of Soulard, Escalante, Pike and Lewis and Clark. Wheat suggests that Pinkerton struggled to reconcile conflicting reports from Soulard and Pike, particularly in the Missouri Basin. He introduces the curious convention of showing a dashed line noting the route of the Missouri River 'according to former conjectures.' Further to the south he notes the path of the Missouri according to M. Lewis. The great basin is particularly vague, with the Great Salt Lake, or rather an embryonic version of it, appearing much further west than is common. It also shows the apocryphal Buenaventura river flowing into the lake from the mountains in the northeast. Pikes Peak appears, but is not named. Florida is attached to the Spanish dominions. We are not certain to whom to ascribe the variations of coloring apparent on this map as we have not been able to compare it with a similar map from the rare 1818 edition, which has proven extremely elusive. In the far north hopeful traces of the Northwest Passage remain, with the seas identified by Mackenzie and Hearne - likely the Dolphin and Union Strait - duly noted. Greenland is also, in a curiously advanced step forward , detached from the mainland. Drawn by L. Herbert and engraved by Samuel Neele under the direction of John Pinkerton. This particular edition further recognizes Bradford & Inskeep and Moses Thomas, an important Philadelphia scholar and author of several important works on Lewis and Clark. This map comes from the scarce American edition of Pinkerton's Modern Atlas, published by Thomas Dobson & Co. of Philadelphia in 1818. Good. Minor dampstaining in the lower quadrants. Else clean. Blank on verso. Rumsey 0732.042 (British edition). Phillips (Atlases) 724. National Maritime Museum, 409. Phillips (America), p.597. Wheat, Carl Irving, Mapping the Transmississippi West, 1540-1861 (5 vols), 311.